We had one of the smoothest moving day mornings of our trip as we packed everything up at Cahokia RV Parque. Without even trying we were on the road by 9:30 on our way to Kansas City. 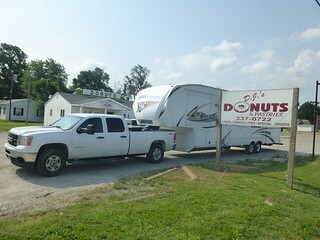 As we pulled out and said good bye to our campsite and began our last Thursday of this trip Brielle said, “bummer, we never did get to try those donuts.” Every time we drove into St Louis we passed this little donut shop called DJs Donuts. We have stopped for donuts on moving day twice before and both times were more like lunch time donuts: once in Panama City and another time in Philadelphia. So I figured we needed to have breakfast donuts for a change and I pulled Ava and the Beast into DJs to get some fuel for our bellies. One could spend a long time in St. Louis before boredom set in. 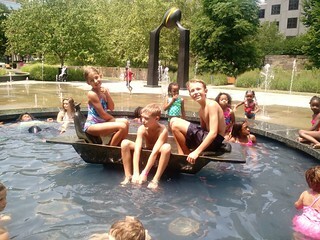 We have one day left in this city and so decided to check out a sculpture and splash park in downtown called City Garden. Dacen was in a funk and really didn’t want to do anything but once we got to the park and he saw the splash area he cheered right up and had a lot of fun with the other two. It was super hot but we stayed cool in the shade of the trees and/or splashing in the pools and fountains. 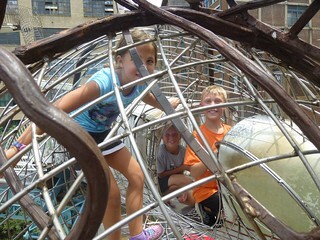 After a picnic lunch we explored all of the art pieces on display in the park. They were all fun and unique so we posed and took pictures with most of them. My cousin had recommended City Museum, Steph had heard great things about City Museum and when our neighbor back in Kentucky heard we were going to St. Louis he said, “oh…you HAVE to go to City Museum!” And so we had no choice…we would have to endure another museum. We have been to so many museums and we have enjoyed almost all of them and always learned something. Would we enjoy this one and would we learn anything? Yes and yes! 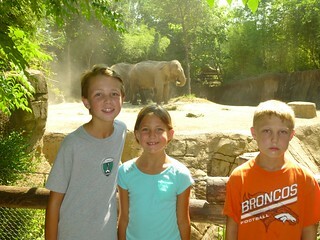 Today we headed across the Mississippi river to the St Louis zoo which is free. Yeah, FREE! They do charge for parking, however I am not much of a zoo guy so I dropped the fam off at the entrance then drove about a mile further into the Forest Park where there were some covered pavilions and I was able to get some work done. They saw elephants, apes, hippos, ROUSs (Princess Bride ref) and despite the heat they also saw polar bears and penguins. Yesterday we moved from Memphis to St Louis…actually, we’re on the east side of the Mississippi in Cahokia, IL. The campground has a pool and the heat makes that a very refreshing and popular place for the kiddos. 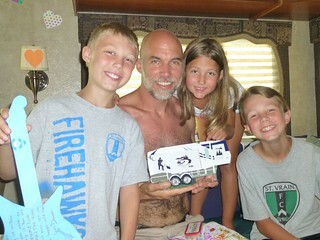 Today is Father’s day and the kids showered me with gifts. Brielle gave me some thumb tacks and fishing lures accompanied by a music themed, Memphis style card she made. Caden gave me a half cup of coffee and his usual busy and super creative card. The half cup of coffee originated in NYC where he saw a half coffee mug that said “NYC is so expensive I can only afford half a cup”. He really wanted to buy it for me but I told him it was too expensive for the utility it provided. Thus was born his idea to convert one of our existing mugs to a half cup with duct tape covering half of the opening and a note that said ” my dad is so cheap he wouldn’t even let me buy him a half of a mug…so I’m gonna let him put some of his cheap instant coffee in this mug with duct tape over half the top”. Dacen made me a really cool bass guitar shaped card and a Gibson guitar pick threaded through the paper strings. I also got a cool 5th wheel shaped picture frame that they kept hidden from me in this tiny house since back in Virginia. The kids all gave me lots of hugs and kisses and told me again how much they have enjoyed our trip…that’s the best gift of all! !